"Darn, forgot to blog about this." But Saturday at least, Parnassus didn't need the publicity. 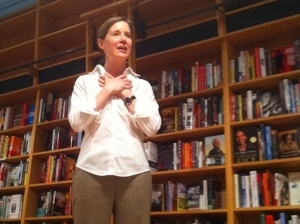 I assume Ann Patchett (above) classy novelist and bookstore investor was there, and thanks to a nudge from a friend I saw and recognized Nicole Kidman (I've seen her before at kid-centric stuff and thought her just a particularly tall and good looking mom). 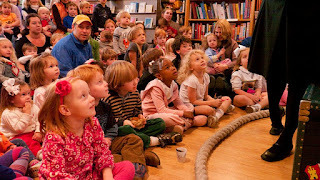 Why write about a bookstore? A real bookstore can offer far more to you and your kid with autism than the internet can. the room and let something catch your eye without knowing what you wanted when you walked in. Your kid can pick out a book on his/her own that is theirs to keep. And sometimes a knowledgeable staff can really help you out. book blocks, perfect for young readers. What local bookstore do you treasure? Do you still have one? We do-now.